UGA Idea Lab Mini Grant recipient and Masters of Fine Arts student Cristina Echezarreta has been working in close conjunction with the Georgia Prison Beekeepers program and the UGA honeybee lab in order to explore the similarities of prison systems and bee systems. Echezarreta had taken notice of the peculiar system of honeybee democracy. 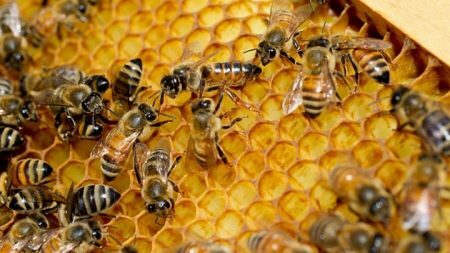 When honeybees want to leave their hive and scout out a new location, they share information with one another and come to a collective decision. “It’s not just about the queen bee and she makes all the rules, it’s more so about the collective,” Echezarreta said. Echezarreta took this idea and put it in practice within prisons. Echezarreta takes photos at the prisons and helps gather supplies so inmates can create artwork together and paint hives, working together and helping each other, much like a colony of honeybees. Through her work in Georgia prisons, Echezarreta said she enjoys the collaborative aspect of the project, which is a change from her solo projects. “This is more of a different project, a more socially engaged project, a more collaborative project rather than me just being in my studio,” Echezarreta said. Echezarreta said working with the Prison Beekeeping program has helped her learn to not stereotype and to see things from different perspectives.